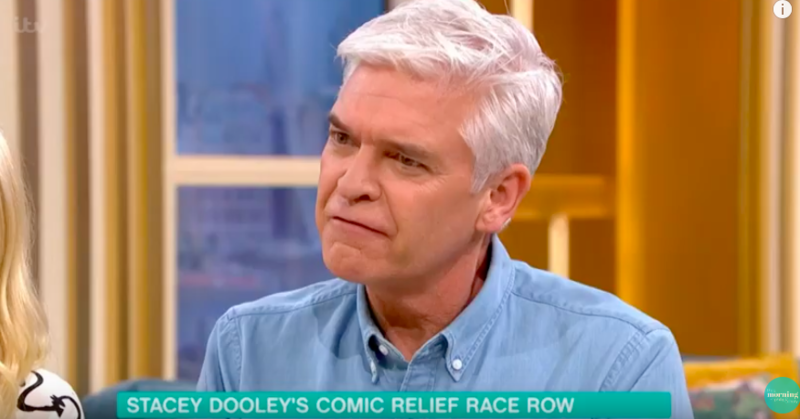 On today’s episode of This Morning presenter Phillip Schofield weighed in on the race row circulating over Stacey Dooley’s recent trip to Africa with Comic Relief. The silver fox and co-host Holly Willoughby were joined by Vanessa Feltz and Dr. Ranj for a discussion on the topic, which has seen former Strictly star Stacey branded a ‘white saviour’ by MP David Lammy, after she posted a picture of herself smiling while holding a black child. After listening to Vanessa and Ranj’s views on This Morning, Phillip opened up about his own thoughts on the matter, explaining his view that race shouldn’t even come in to charity work. And things only got more heated, when Holly and Phil took a call from MP David Lammy himself, to clarify his thoughts on the situation. He explained that he took issue with how Comic Relief went about their work for important causes, questioning why ‘white heroines’ are sent out on ‘expensive flights’ to help, instead of influential Africans. David said: ‘Let’s just be clear, there is obviously a role for charity, and one celebrates people doing good causes particularly in Africa. But there are big questions about how it is done. Phil then continued to ask David another question, but things got super tense when the MP insisted he still had things to say. ‘Listen, listen to me, listen to me for a second,’ he protested. Becoming frustrated, Philip appeared ready to hit back, before letting the MP continue with his explanation. The MP went on, saying: ‘You could have had some Africans talking about their country instead. You could go to Africa’s comedians. You could film part of the night in the continent in Africa. Phillip also confronted David about his own involvement with Comic Relief, asking him why he declined to help with their charity work if he was so affronted by Stacey’s role.